Walking up on my 2015 buck. I watched him fall and could easily see him laying dead from my stand, only about 45 yards away. I waited an hour to go check anyway. Also note the thick healthy woods, lots of diversity. Perfect deer cover. Last September our new gallery, Chisholm Valley Wildlife Art held its grand opening. We held it on the Saturday and Sunday of the first two weekends of that month. My son Eric and his fiancé Marissa were married in Rochester on Friday, so needless to say, it was a very busy weekend. The show itself was a great success, far better than we could have asked for. People began to arrive even before we officially opened the doors. The first Saturday was busy and every following day seemed to bring even more people. We don’t have a good count on how many, but I would guess somewhere over 750. We do know that there were people here from at least 10 different states. Friends and relatives from near and far as well as many people from the local area were there. There were also hunting buddies, gallery owners, a few artist friends, former in-laws but no known outlaws, old classmates and even some of the nuns who were my teachers a lifetime ago. Sales also were far greater than we could have asked for…except for the nuns of course. All in all it was an exhausting couple of weekends, but very successful. Reminiscent of some of the shows from the past when wildlife art was super hot. And most of all I would like to thank my wife Juli, who did an amazing job of planning, inventory, sales, greeting people with her ever present smile, her constant unwavering support as we planned this show, and for making my life so much easier and better. 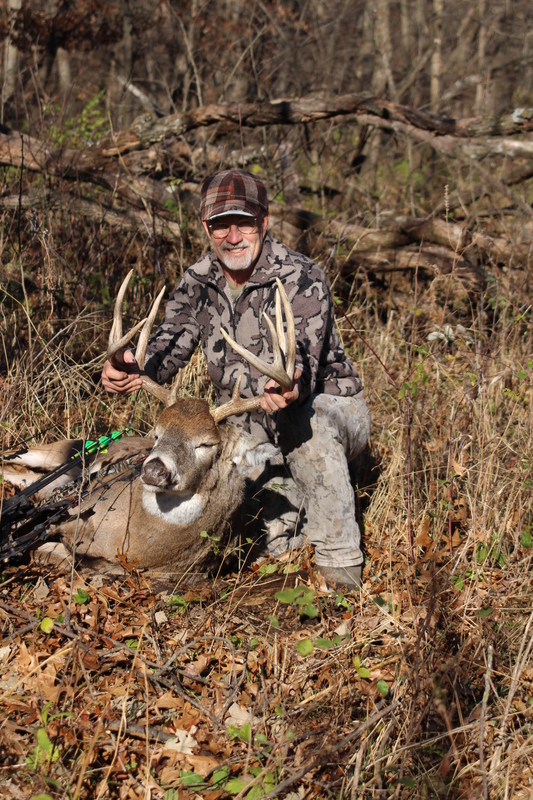 This has been a fantastic week of deer hunting! Yesterday’s hunt, and the days before that were some of the best deer hunting I have ever had. George has a great deer property that he manages for deer and other wildlife as well. The number and quality of deer on his land is incredible, but it isn’t just the land or the deer that have made this such a wonderful hunt. George really wants me to be successful, and to take a great deer. I could go anywhere, take the ATVs, hunt his stands and tap into his enormous knowledge of deer and his land in my quest for a big Iowa buck. And George’s wife Pat was more than I could ask for as well. A cup of coffee in the morning, and a great supper in the evening. Pat told me when I first arrived that she was going to spoil me, and I think she did. I first met George at Pheasant Fest in Des Moines, Iowa a few years ago, he knew me by my artwork. But like many of the people who collect my work, they have become friends as well. So thanks to you George and Pat for your hospitality, for sharing your great place with me, and most of all, for your friendship. I will cherish this hunt forever. The woods are dead quiet today, and seem even more so after the wild and windy day that yesterday was. It is clear and cool, with a slight breeze from the SW. I am in the same stand as I hunted yesterday. Here is what happened. 7:05: A nice buck chased two does around in the woods about 150 yards to the south. Lots of grunting and chasing sounds. Soon they disappeared but about 10 minutes later one of the does ran past me. I got ready and soon the buck appeared. He came to about 50 yards and stopped behind an oak, waited and watched for a bit, then turned to chase the other doe. After a while I could hear him raking a tree with his horns. I never got a good look at him, but he was certainly a good mature buck. 8:30: A very wide, dark racked 8 point buck just walked on a trail about 50 yards below my stand. I tried to call him, he looked, turned and came towards me for a bit, then turned and left. 8:59: Two bucks chased a hot doe below me (east) and to the side. One buck was a nice mature deer, possibly the one that came close earlier. The other one was a much bigger buck. He was heavy with lots of points, probably some were non-typical. He was limping badly but chased the smaller one away, then stopped directly downwind right where the wide 8 walked. Then he winded me and blew…lots of times. Soon the doe ran and he followed. By far the best deer I’ve seen yet. 9:16: A doe came sneaking by from the same place that the great 10 point was yesterday, in the brush downwind of me. She was followed by a nice 2YO 8 or 9 point. I reached for the camera but stopped when I saw what was following. A very heavy bodied older buck with a very nice rack. I took the shot at about 20 yards and hit a branch on the way in. The arrow deflected back a bit but still good. He ran about 30 yards and dropped, but did not die right away. I can see him but I will wait awhile anyway. 9:20: A 10 point buck just tracked by on the path of the doe. Very thin horns. A 2YO? A yearling? All morning: Lots of turkeys. 9:50: A 2YO 8 point walked past the deer I shot, smelled the air a bit and then walked directly under my tree. 10:18: A weird buck just passed by. On his left was a long very thin beam that forked on the end. On his right was a long, curved spike. 10:42: Just walked up to the buck I shot. A great buck, a perfect 10, old and heavy. He is a bull-necked, beat up mature buck, full of puncture marks and patches of hair missing from fighting. The shot was a bit far back, but all in the chest. He traveled about 25 yards and probably died in minutes. George and I took lots of photos, I’ll post them later. This is a great old buck, the biggest body I’ve seen on this trip. And although not the biggest rack, I’ve seen two that were bigger, certainly not a deer to pass, and I am thrilled to have taken him. I will follow this with an epilogue and a summary tomorrow. 7:35: A great buck just came very close to my stand from behind. He came into the wind, from the north east. He stopped behind a lot of brush, about 25 yards away, got nervous and backed away. He was the best looking deer I have seen so far. A perfect typical ten, dark rack, long tines and high. Not heavy but well proportioned. Probably about a high 150s, possibly more. I know some serious Iowa bow hunters who would pass him, but not me. I would be thrilled to take a deer like that, and had the bow up and was starting to draw when he turned. It was a letdown when he walked, but that’s hunting. 8:12: Two Tom turkeys walked by. 8:40: A yearling buck just walked by on the trail that I hoped the deer would go on. Too bad the nice 10 didn’t do that. 8:58: Four longbeard turkeys went by, about 30 yards away. Lots of gobbles. Also pheasants crowing and snow geese calling overhead. 12:00: No action for a long time now. I am on a ridge top in the middle of three tall but narrow oak trunks, about 12 feet up. The wind is fairly strong and gusty, and the tree is in constant motion. I looked straight up at the swaying treetops once and instantly got vertigo. Don’t think that I’ll do that again. I could almost get seasick, if that’s possible in Iowa. I’m going to give it another half an hour and then call it a morning. Afternoon: I am hunting the north end of the farm this afternoon, from a tree that I took a doe out of the last time I was here. Here’s what has happened so far. 3:50: I wasn’t even set up, I had not pulled my bow up yet when a yearling doe walked up, 10 yards away and downwind. She knew that something was not right, and so she began to move away. 3:55: A 3YO 4 by 5 buck just came into sight and raked his antlers on a small tree for about 10 minutes. He passed by about 20 yards away. The shot was brushy but very do-able. I passed and took his picture instead. 4:15: Another doe walked under my tree. Quitting time: Another doe walked passed and went into a picked bean field in back of me. Then as I was climbing down a big white racked buck walked by about 30 yards away. It was too dark and too much brush to see well, but I think it might be the buck that I saw earlier. He came from the direction that the earlier buck had gone. I went back to the house in the dark. Pat made stuffed pork chops for supper, they were great as usual, and George and I visited until after eleven. Tomorrow will come early. I am on stand. It is sprinkling, threatening to rain, and with a light south wind. I saw several deer on the way in, including a nice buck tending a doe. He was at least a 2 YO, but the light was low and I couldn’t see any more. 7:22: A very nice buck with tall white horns just ran by about 100 yards away down in the woods. 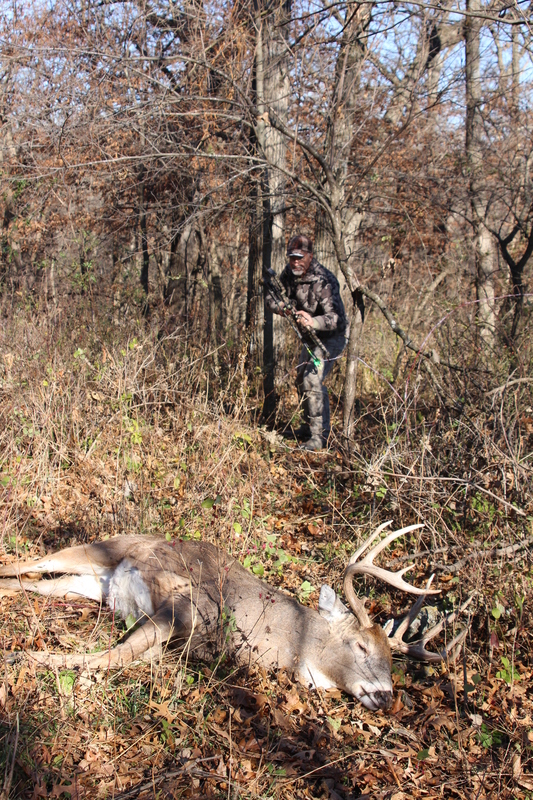 8:08: a nice buck, at least a 140″ deer, at least a 3 YO, just followed a hot doe in the same direction as the last buck. I tried calling them, they looked but we’re not interested. 8:39: I just got busted by a yearling buck that came up behind me, at about 15 yards. This stand requires constant vigilance for 360 degrees. I don’t want to relax and make that mistake on a big one! 10:25: Another nice buck just chased a doe down in the woods north of me, same area and going in the same direction as the last two. Same deer? Hard to say. I’m thinking about moving a stand down there. 12:00: Quit hunting and set up a new stand 25 yards deeper in the woods. 3:00: a very intense storm blew through, heavy rain & strong winds. Tornados in the area. Evening: I am in a new place, good for west winds. I call this place ‘bobcat trail’. A huge silver colored bobcat walked up to my stand here I 2011, the best looking bobcat I’ve ever seen. 4:50: a yearling buck walked by at 15 yards. Today is the first day of my 2015 Iowa bowhunting. 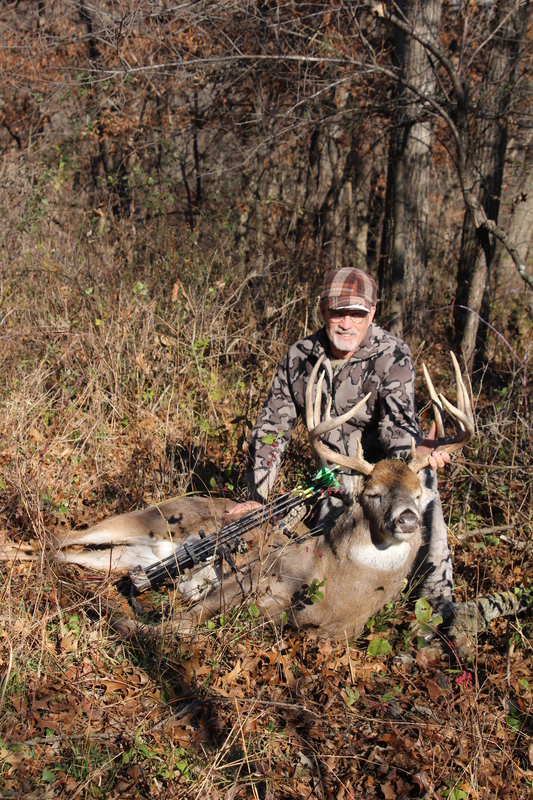 I will be hunting with George Wolf on his land near Osceola, Iowa. I hunted here in 2012, and took a 3 1/2 year old buck on a shortened hunt. I want to stay longer, hunt harder and be more selective this year. When I got here George and I got on the ATVs and took a tour of the property, it looked great. We even saw three mature bucks. That evening I sat in one of George’s stands. I got there late and saw several deer on the way in. Once on stand I soon had turkeys going to roost to keep me distracted. They were so noisy that I almost missed a different cadence of the crunching of leaves. But I didn’t and I turned to see a totally relaxed buck pass by in back of me at about 20 yards. He was a nice 2 or possibly 3 year old. I got back to George’s house in total darkness. Pat had prepared a supper of bluegills that George caught last winter and we had a good visit until bedtime. I’ll give an update on the hunt tomorrow, stay tuned.